“The Fort Bend Beekeepers Association (FBBA) recommends that if you have a bee hive located within a building or structure that you contact a Bee Removal Service or a Pest Control company. Fort Bend Beekeepers Association does not provide hive removal services nor give references for those that do. If the bees have established a home in the wall of a building you will need the help of a bee removal service and or an exterminator. You will need to do an Internet search for “bee removal near me” to identify bee removal services in your area. Bee removal is a highly laborious job and should not be expected to be done at no cost. Simply attempting to kill all of the bees is usually a bad idea since most of the bees are working to maintain the hive & keep it clean. All of the dead bees, their brood, nectar, honey, pollen and comb will need to be removed. Lingering scents will be attractive to more swarms of bees. Preventing future problems is an important part of bee removal. And any failed attempts to kill the bees may make finding someone to remove them more difficult. Swarming is the natural method honeybee colonies reproduce as a whole. The original colony replaces the old queen, who leaves the hive with half the worker bees and as much honey as they can carry. Swarm clusters land on a structure near their original hive location and scout bees leave the cluster in search of a new hive location. The best situation is a Swarm of bees that has chosen an easily accessible place to take a break as they look for a new home, but sometimes a swarm can be captured even though it is high off the ground (scroll down to view Swarm Capture Video Using a Bee Jug). 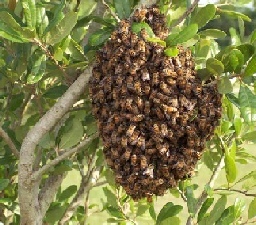 If you find a swarm honey bees, it is important that you act quickly before they decide on a new home. The worst thing you can do is to expect them to just go away. They most likely will, but if they decide to move into someone's house they can cause expensive problems. Fort Bend Beekeepers Association does not provide hive or swarm removal services nor give references to those who do. However some individual members of the Association provide swarm removal services for the Fort Bend County and surrounding areas. Those members that provide those services may be contacted by filling out the form below and clicking the “Submit” button. In the form below an "*" denotes a required field. Address where the Bees are located. If a physical address is not applicable then provide either cross streets or GPS coordinates if possible. Please indicate how far off the ground the Bees are located. Please do your best to describe the exact location if the above items are not applicable. I acknowledge that Fort Bend Beekeepers Association is not liable for the acts of any individual providing hive or swarm removal services. I fully accept the terms. Thank you, you should receive a response shortly.